Russian President Vladimir Putin has approved an amendment that decriminalizes domestic violence across Russia. Note : One woman dies every 40 minutes from domestic abuse in Russia. Hungary is going to submit proposals to the European Union to protect Europe's borders by automatically detaining all asylum seekers. Hungary had earlier erected a fence on its Serbian border to apprehend all illegal refugees. The Arunachal Pradesh government today announced that it has implemented 'e-Cabinet', a paperless system to cut down on the time taken to hold a cabinet meeting. The 'e-Cabinet' system uses a web-based software by which ministers can prepare for cabinet meetings, entirely without paper. The system is a multi-user secure solution that keeps information updated in real time. The 3-day Desert Festival of Jaisalmer began today at Sam Sand Dunes. Organised by the Rajasthan government to promote tourism, the festival will feature camel races and turban tying competitions. There will be Rajasthani folk song and dance performances, as well as contests aimed at judging the best moustache. Elahiganj in Murshidabad district has become the first village in Bengal to ban sale and consumption of alcohol and narcotics. About 6,000 residents of Elahiganj decided to do so after six people died of hooch consumption in neighbouring district in January. The village has also decided to impose a fine of ₹2,000 on anyone consuming alcohol or hooch. As per regulations, a doctor needs to announce his fees before the treatment and not after it, the government announced today. The remuneration received by him should only be the amount announced before the treatment, the government further said. The Lok Sabha today passed the Payment of Wages (Amendment) Bill, 2017. This bill seeks to enable employers to pay wages to workers through cheque or directly crediting to their accounts. The bill will replace the Ordinance promulgated in December last year. This new law will help in check exploitation of workers in unorganised sector. The swearing-in of AIADMK General Secretary VK Sasikala as the Tamil Nadu Chief Minister did not take place today. O Panneerselvam will continue to serve as the interim Chief Minister until the state's Governor examines the legal implications around Sasikala's appointment. Assam government has proposed to link healthcare of the elderly to the pay of its employees to ensure that they look after their parents. Presenting the budget, state finance minister Himanta Biswa Sarma said every government employee must take care of his or her parents, else the government will deduct a part of the salary and give it to them. Jovenel Moise was sworn in as Haiti's President and will serve a five-year term. Moise won a re-run presidential election last year with 55.6% votes after the first round of elections in October 2015 were scrapped over fraud allegations. Moise replaces interim president Jocelerme Privert, who was appointed to the post in February 2016. 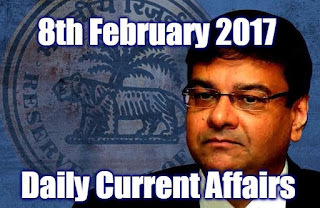 In it's 5th Bi-Monthly monetary policy review, the Reserve Bank of India (RBI) kept the Repo rate unchanged at 6.25%. This is the second time in a row that the repo rate has been kept unchanged. The reverse repo rate also remains unchanged at 5.75%. 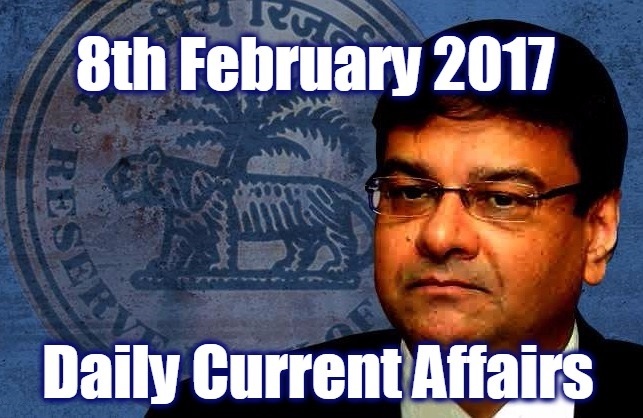 The RBI further said that the expected growth is 6.9% for the 2016-17 fiscal. Statutory Liquidity Ratio (SLR) - 20.75 per cent. The weekly cash withdrawal limit from savings bank accounts from ATMs or banks will be increased to ₹50,000 from February 20 and there won’t be any withdrawal limit from March 13, the Reserve Bank of India announced today. Note : The weekly withdrawal limit now is ₹24,000. Bank of America has opened three completely automated branches in the US which do not employ any human. At the automated branches, customers can use ATMs and have video conferences with the employees at other branches. About a fourth of the size of a typical branch, these branches sell mortgages, credit cards and auto loans rather than cashing cheques. The Navapur Railway Station is located in two states, with half of the station being located in Maharashtra and the other half in Gujarat. A train that halts at the station is also positioned between the two states. Ethiopian runner Genzebe Dibaba broke the women's 2,000-metre world record, running the distance in five minutes, 23.75 seconds, at an indoor arena in Spain.